One of the pains of looking after Exchange 2010 is putting in an Out of Office message for someone who forgot to do it before they went away, and either can’t or won’t do it themselves remotely. If you’re lucky enough to be able to delegate this task out to others, you can easily do so with “Role Based Access Control”. There’s a nice built in group called ‘Help Desk’ which gives the members access to everyone’s Outlook Web Access Options (not their actual emails). These options include Out of Office as well as several other useful settings that are not particularly private or contain confidential information. From this, you can double click on the Help Desk entry from the list of Role Groups, and add members to the list. 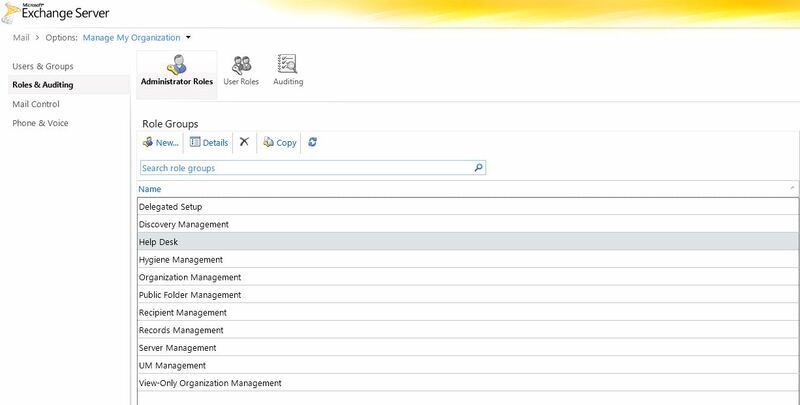 From here, you can drop down the ‘Manage Myself’ menu and choose ‘Another User…’, select your user and you’ll see the selected users options screen, allowing you to set Out of Office. Excellent. A common problem solved. Thanks! Glad it helped you, thanks for commenting!